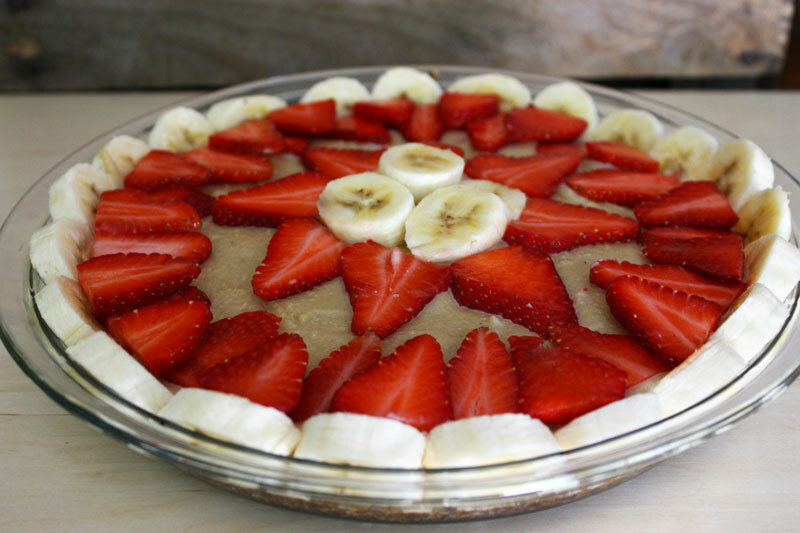 A fresh, flavorful, and filling strawberry banana cream pie made with a base of cashew cream; on top of a cinnamon, walnut, flax seed and date crust. 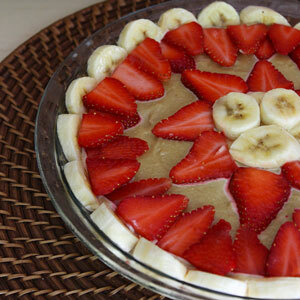 To me there’s nothing better than a simple healthy decadent pie loaded with fresh fruits, nuts and seeds for breakfast. It gives you that full feeling, without feeling heavy, and sustains you for some hours. Right now the only berry we have available at the farmers market, is strawberries; but can you imagine blueberries, raspberries, mulberries. Mmmmhmm! 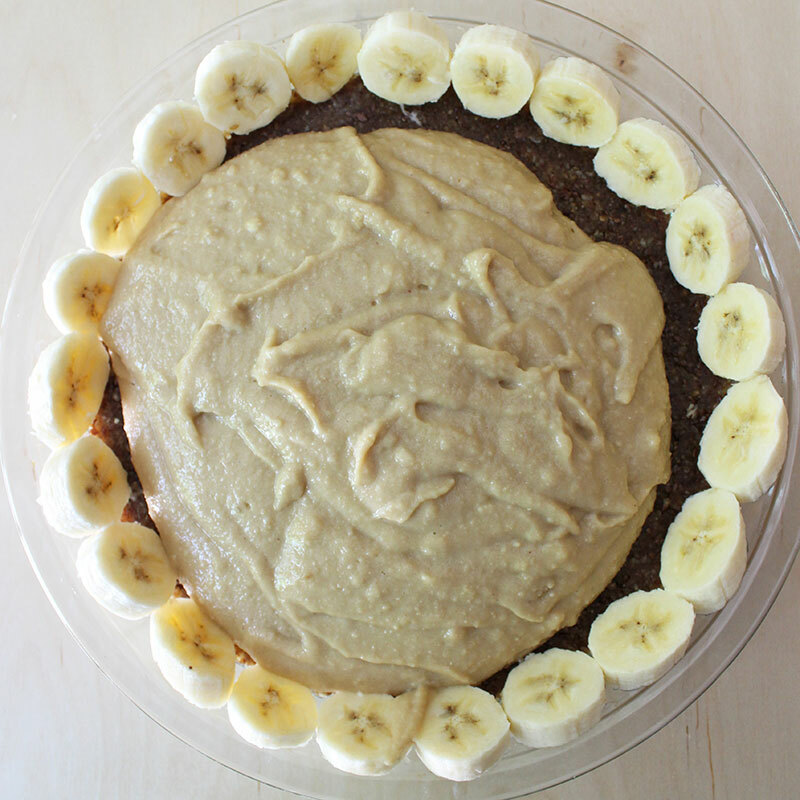 This recipe is reminiscent of the cultured cashew cheesecake, except it’s not cultured or fermented, so it’s much easier to make. 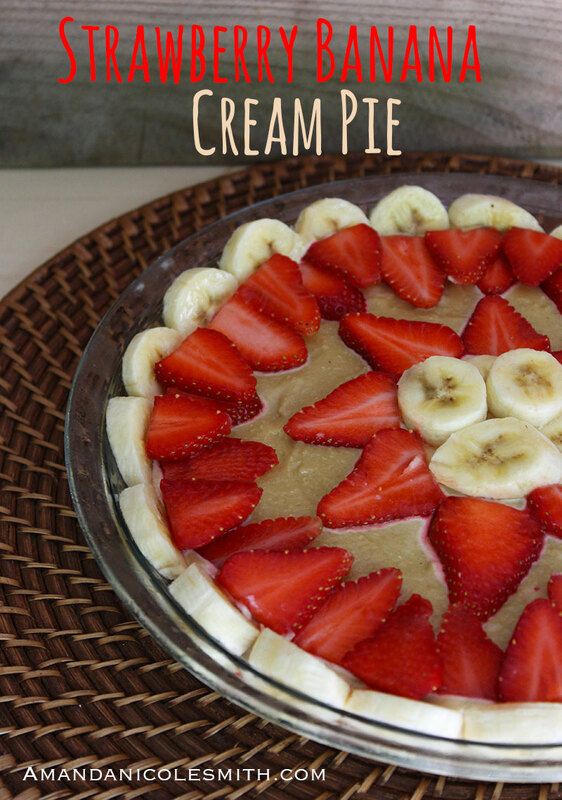 There is also a lot more fruit and a lot less crust and cream, making it lighter for summer.There is also the variation in the crust using walnuts instead of pecans. I used to soak my cashew before blending to make a cream, but if you don’t scrape the walls consistently, stop the blender, dig the pieces out from under the blades, and add water little by little in-between, you run the risk of a thick, not so light and fluffy cream that made you go crazy in the process, ha! For pies it is essential to have a light and fluffy cream, so there is a simply way to solve this problem! Make cashew flour first, then add in the rest of the ingredients. This way you can ensure there will be no hidden cashew pieces that didn’t get blended and you don’t have to scrape underneath or stop to scrape the walls every 5 seconds. Plus it takes about 10 seconds in the vitamix to make flour. I’m pretty sure my old $30 blender could do the job just as well. If not my $40 food processor with serrated blades definitely could have done it in less than a minute. Yup it’s that easy, and can be applied to any nut-based cream recipe. Cashew pieces are much cheaper than whole cashews, and since we are going to be blending the cashews into a cream it doesn’t really matter if they were whole or not. Luckily at my local health grocery store, they carry organic cashew pieces in bulk for only $6.99 a pound, 2 cups of cashews is about .60 pounds. Nuts can be expensive, especially organic, so if you want a more economical pie, these variations may be for you. I know a lot of you suffer from some sort of nut/legume allergies, so this is for you too! I would substitute cashews for avocado and banana. I know that sounds weird, right? But trust me, check out this avocado chocolate cream pie, it does have cashews in it, but you can definitely make that pie with double the avocados instead of cashews, I’ve done it, and it comes out just as delicious. Avocados are a great fat substitute for anything that has nuts and is suppose to be creamy. They are also cheaper, making for more economical pies. My only reservation, they oxidize quickly, but there are ways to combat this con. Lemon juice helps to slow oxidization, and of course covering the pie tightly with a lid, of plastic wrap is the best defense against oxygen getting in and turning everything brown. You can also use the avocado pit as the center of your decorative fruit design to help prevent oxidization. If you use banana, there’s a greater chance of you pie turning brown, I might think about using 1/4 cup lemon juice, about a whole lemon, rather than an 1/8 cup. Now I’m not gunna lie, I have not tried just avocados and bananas for this particular recipe, but I’d imagine it would work just as well. In the near future I plan on making this pie again with this no nut variation, and I’ll give further details. There are nut-less crust options that involve seeds! However, seeds have a very distinct flavor that you’ll either love or hate, and when they are blended, their delicate oils can oxidize which makes them taste funky. Luckily salt, and a tightly sealed pie can slow down the process. Each of these seeds will need to be blended into a flour before adding the sticky ingredients. Sunflower seeds- They probably have the most substance, and a good texture for replacing nuts, but I have found they oxidize quickly and develop the weirdest taste of them all after a few days, so if you use them, eat the pie within a day or 2. Pumpkin seeds– They work well, and I haven’t experienced any weird flavors. Their texture just isn’t quite as good, so I would probably mix them with the sunflower seeds. Hemp seeds– Hemp seeds also work very well, they are just a bit more expensive. Flax seed– This crust already has it, but using 3/4-1 cup would work as well, along with another seed of choice. 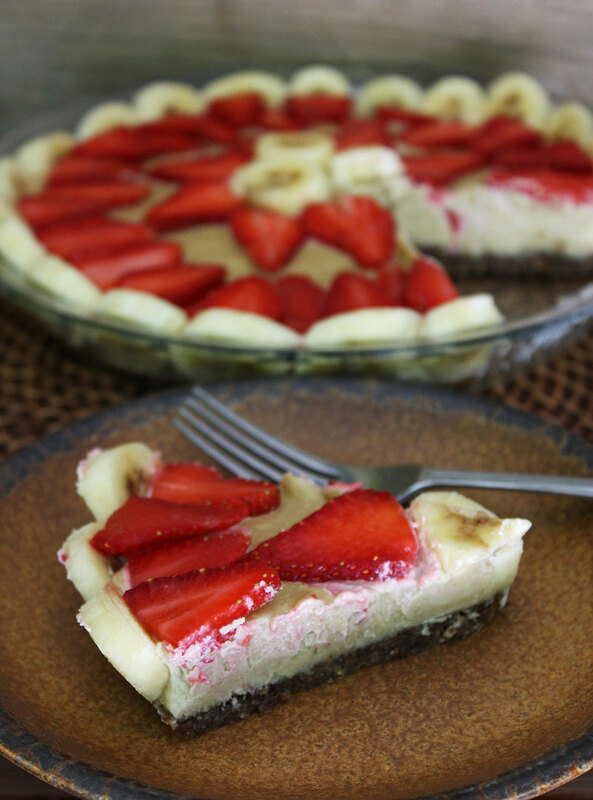 A fresh, flavorful and filling nut, seed and fruit pie. 1/8 cup lemon juice; about 1/2 a lemon. Grind flax seed into a flour, in a spice/coffee grinder, or single serve blender. Remove date pits. If the dates are stuff and dry, soak them for 10-20 minutes. Add all of the ingredients to a food processor and process until fine and it all sticks together. Pat down crust into a 9-inch pie dish. Add the filing on top of the crust. Place the pie in the freezer for 1 hour, or until firm. 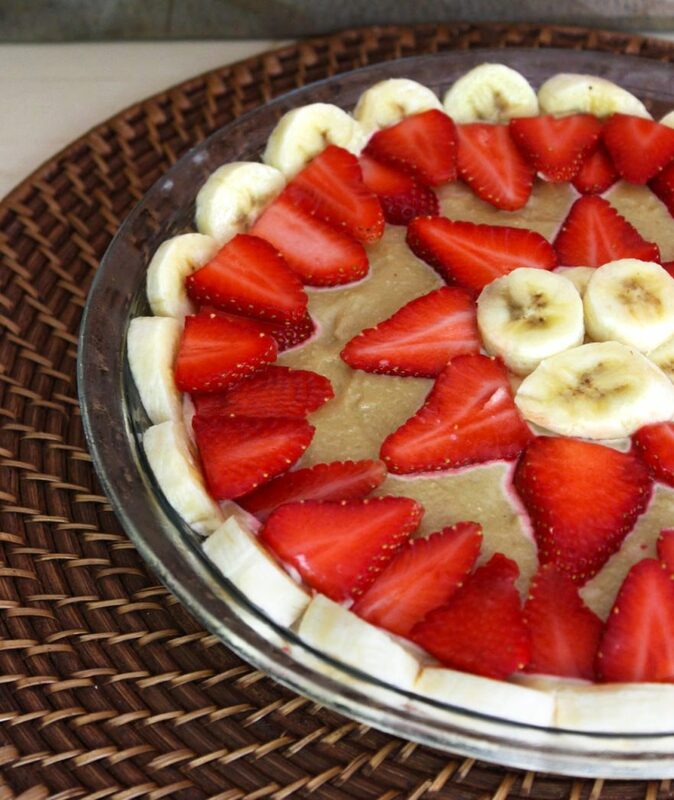 Slice fruit thinly, to make a design on top, and mix with lemon juice to prevent oxidization. Or to further prevent oxidization, chop the fruit into small pieces, mix with lemon, and stir into the pie filling. Tightly seal the pie with plastic wrap, and store in the fridge for up to 4 days. Or you can stop win the freezer for up to 1 week.